Bhutan is a country unique in the world. One of its peculiarities is that it has enshrined in its constitution the “national gross happiness”. It’s a scale to measure the level of happiness among its inhabitants. To contribute to this, the country shuns globalization andthe population has high social protection. TV only appeared in the 2000s and it is the first country in the world to have banned the sale of cigarettes. But are its 750,000 inhabitants really happy? Nestling in the foot of the Himalayas, Bhutan is mostly criss-crossed by tracks clinging onto the peaks of dizzy mountains. During the monsoon period, travellers juggle with mud and landslides, traffic is often jammed for several days on end. To resolve the situation, the government has called on Dankas, workers from India who live in the most precarious of conditions. With no protection, they blast wider roads and tarmac them at over 3,000 meters altitude. And there’s work to be done: until 1961 there was hardly a single paved road. 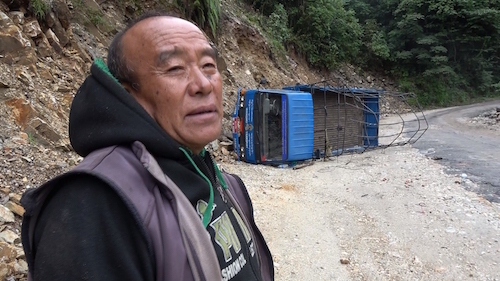 Today, Bhutan is trying to create a road network to open up the country.